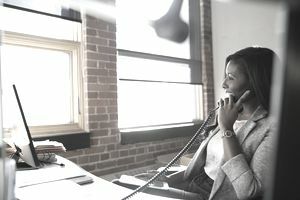 Everyone at your business needs to know how to answer the phone professionally, not just the receptionist or the customer rep. You never know when the person who's supposed to answer the phone will be unable to do so and someone else will be stepping in and picking it up (especially if you're operating a home business). Even in these days of texting and email, the phone is still most business's primary point of contact with customers and the way your company's phone is answered will form your customer's first impression of your business. If the person answering the call is unprofessional, it may be that customer's last impression, too! Here's how to answer the phone properly and win business instead of losing it. 1) Answer all incoming phone calls before the third ring. 2) When you answer the phone, be warm, enthusiastic, and professional. Your voice on the phone is sometimes the only impression of your company a caller will get. 3) When answering the phone, welcome callers courteously and identify yourself and your organization immediately. Say, for instance, "Good morning. Cypress Technologies. Susan speaking. How may I help you?" Don't just say "Hello". No one should ever have to ask if they've reached such and such a business. 4) Enunciate clearly, keep your voice volume moderate, and speak slowly and clearly when answering the phone so your caller can understand you easily. 6) Train your voice and vocabulary to be positive when phone answering, even on a "down" day. A positive vocabulary is one that focuses on helping the customer. For example, rather than saying, "I don't know", say, "Let me find out about that for you." 7) When you answer the phone, take phone messages completely and accurately. If there's something you don't understand or can't spell, such as a person's surname, ask the caller to repeat it or spell it for you. Then make sure the message gets to the intended recipient. 8) If people have had to leave you messages, answer all your phone calls within one business day. I can't emphasize this one enough. Remember the early bird? The early caller can get the contract, the sale, the problem solved... and reinforce the favorable impression of your business that you want to circulate. Few things annoy callers trying to reach your business more than unreturned calls. 9) Always ask the caller if it's all right to put her on hold when answering the phone, and don't leave people on hold. Provide callers on hold with progress reports every 30 to 45 seconds. Offer them choices if possible, such as "That line is still busy. Will you continue to hold or should I have ________ call you back?" 10) Don't use a speaker phone unless absolutely necessary. Speaker phones give the caller the impression that you're not fully concentrating on his call, and make him think that his call isn't private. The only time to use a speaker phone is when you need more than one person to be in on the conversation at your end. Ask the caller if you may put them on speaker phone before you do it. 11) If you use voice mail or an answering machine to answer calls when you can't, make sure that you have a professional message recorded, that does the same thing as tip #3, and gives callers any other pertinent information before it records their messages. Update your voice mail message as needed. For instance, if your business is going to be closed for a holiday, update your voice mail message to say so and to say when your business will reopen.